It's the long awaited Vegas trip with everyone. Now's the right time to start the long journey. When I was in Vegas during the winter time I was staying at the Venetian with Ms. Lin and our Mom. This truly is a fall from grace! 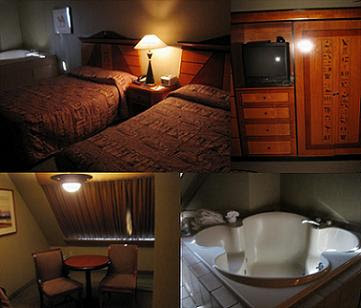 For the amount of money we were paying a night for the so-called "Spa Suite" it's ridiculous. The room is tiny and dingy. In short BLECH! We stayed in the pyramid so I guess the rooms are older there and the AC is not so great. The walk from our room is equidistant to either inclinator. One thing I did like was that they gave Bath & Body Works condiments, but not if you ask for more. If there wasn't a group of us staying together I would have been even more upset. We all agree it's a really lame hotel/room. The pictures on the internet showed a couch and there wasn't any. It was a tiny room that isn't even worthy of being called a suite! We wanted to come here because of their pool and I will give them credit that the pool looked nice. Nothing special but it was pretty. I would never stay in this hotel, unless it's a dire situation. The sad thing is the small hotel we stayed in for July 4th was a much better deal than this one. Okay the best part of the hotel stay was the super thin walls that really entertained Mango. Apparently the people next door could not keep it down and we heard them quite often. It was extremely hilarious because I woke up to girls giggling and then I found out why. Then later that day we had another incident where Mango was taking a shower. She missed out and you should have seen her reaction. It was priceless! ^_^ Just for that, it made it all worthwhile!